Kells (; Irish: Ceanannas) is a town in County Meath, Ireland. 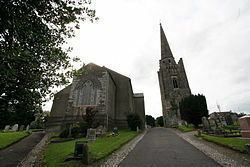 The town lies off the M3 motorway, 16 km (10 mi) from Navan and 65 km (40 mi) from Dublin. 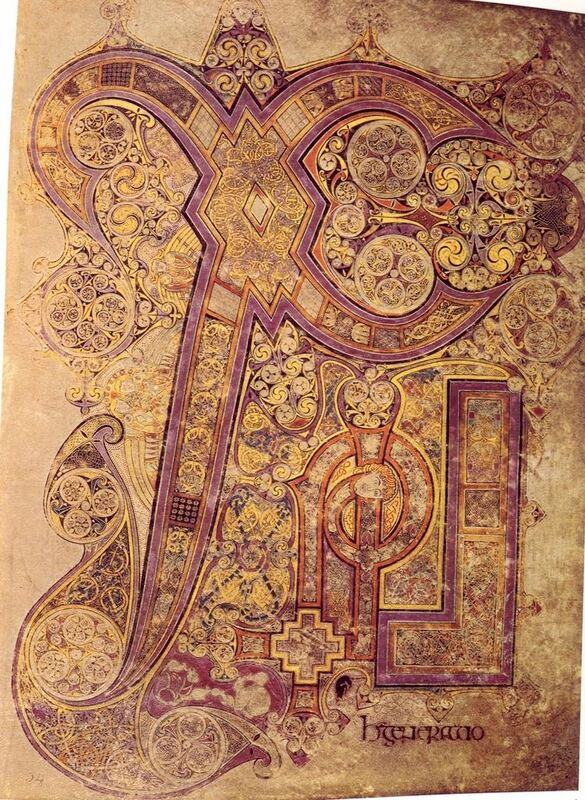 It is best known as the site of Kells Abbey, from which the Book of Kells takes its name. The monastery at Kells is thought to have been founded around 804 A.D. by monks from St Colmcille's monastery in Iona who were fleeing Viking invasions. Kells became a border town garrison of the Pale and was the scene of many battles, between Bréifne Irish and Hiberno-Normans, both of whom had heavily intermarried. From 1561 to 1800 Kells returned two Members of Parliament. During the rebellion of 1641, Kells was burned by the O'Reilly clan during their attacks on the Pale. 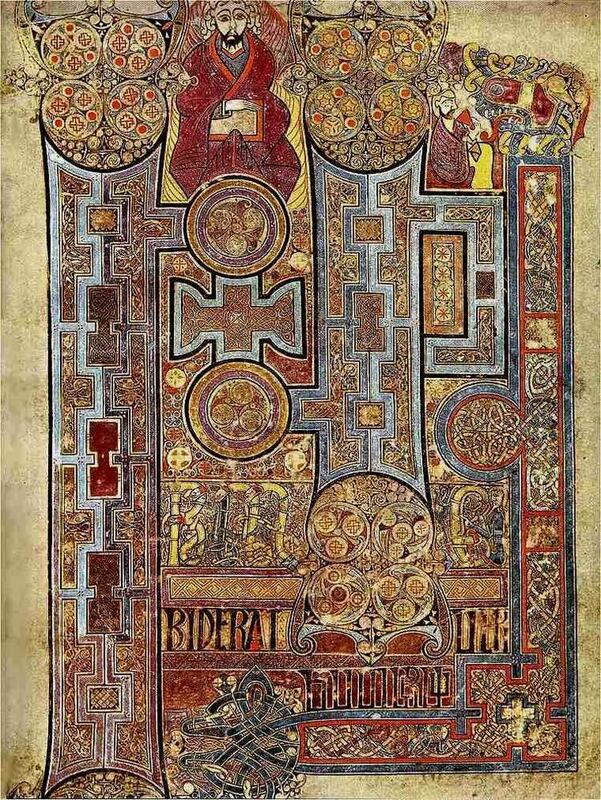 The Abbey of Kells, with its round tower, is associated with St Colmcille (also known as Columba), the Book of Kells, now kept at Trinity College Dublin and the Kells Crozier, exhibited at the British Museum. The round tower and five large Celtic crosses can still be viewed today. Four of the crosses are in the churchyard of St Columba's church. The other Celtic cross was positioned in the middle of a busy crossroads until an accident involving a school bus. It now stands in front of a former courthouse. A roof protects the cross from the elements. Curiously, a replica is completely safe from the elements inside the museum. Just outside the town of Kells on the road to Oldcastle is the hill of Lloyd, named after Thomas Lloyd of Enniskillen, who camped a large Williamite army here during the wars of 1688-91 against the Jacobites. Here also stands a towering building called the Tower of Lloyd, which is an 18th-century lighthouse folly in the form of a giant Doric column, surmounted by glazed lantern, erected to the memory of Thomas Taylor, 1st Earl of Bective, by his son. The tower is around 30 m (100 ft) high. The top offers a view of the surrounding countryside as far as the Mourne mountains in County Down, Northern Ireland on a clear day. The tower was used to view horse racing and the hunt in the nineteenth century. The plaque on the tower reads: 'This pillar was designed by Henry Aaron Baker Esq. architect was executed by Mr. Joseph Beck stone cutter Mr. Owen Mc Cabe head mason Mr. Bartle Reilly overseer Anno 1791'. The area around the tower has been developed as a community park (The People's Park), and includes the Paupers' Grave. This cemetery was a necessity in the times of great poverty in the country. Mass is still celebrated there annually and the cemetery is a reminder of the Workhouse and extreme poverty engendered by changes in farming practice in the 19th century and during the Famine. The population of Kells town (according to the official 2011 Census of Population) stands at 5,888 persons. This represents a slight increase in population over the 2006 Census. There was a 24.8% increase in total population between 1996 and 2002. Until the opening of the new motorway in June 2010, Kells stood as a busy junction town on the old N3 road with over 18,000 vehicles passing through the town each day. Kells was a renowned traffic bottleneck from both the N3 national primary route (Dublin, Cavan, Enniskillen and Ballyshannon) and N52 national secondary route (Dundalk, Tullamore and Nenagh) passing though the town centre. The new M3 motorway (opened June 2010) significantly reduces the journey time to Dublin, as well as the numbers of vehicles in the town. Kells is served by a regular bus service run by Bus Éireann, which takes about 1.5 hours to Busáras in Dublin. St. Colmcilles Boys National school is an all boys school on the Navan road,first opened by the Christian Brothers on January 20th 1845. The present school was opened in 1976 and the Brothers, because of a fall-off in vocations, withdrew from the school in 1985. Damien McGrane b. 1971 professional golfer is a Kells man. Maureen O'Hara Kells born American actress and singer. A statue has been erected in her memory on Farrell Street.